Twin Peaks: The Return, 2017, still from a TV show on Showtime. Season 3, episode 1. Dale Cooper (Kyle MacLachlan). EUCALYPTUS TREES, WEAKENED BY DROUGHT, are on their last legs all over Los Angeles. One fell and knocked out the power lines next to my friend’s house, where I am staying, in Eagle Rock, and we stood on the deck drinking Vinho Verde––delicious, like if wine were beer––watching the action. A fire truck loitered for an hour, produced no helpers, and left. Disruption made the street its own neighborhood. Homeowners came out wondering, hands synchronized on hips. One man retrieved his digital camera and tripod and took commemorative photos. Another ambled the length of his driveway twice an hour to see what was up. For a few hours, nothing. Power trucks eventually came, two then three. My friend walked down to the street, tan and hot in a crop-top, to talk to the workers, but even she couldn’t inspire them to finish faster. I thought this was fine. The only problem, really, was that without working television, or internet, we were missing the West Coast premiere of Twin Peaks: The Return. The light dimmed outside, and my friend and I read books by flashlight and candle. Flies that would normally stay by the window were drawn to the page, and I killed the first by whacking it against a coffee table with The History of Sexuality in paperback and the second by crushing it inside The New York Stories of Elizabeth Hardwick. Its viridian dead body blotted out four or five letters of text in the story “Back Issues,” so that I may never know whether the New York Public Library is at Forty-Second or Forty-Seventh and Fifth. Finishing the Vinho Verde, my friend remembered that by siphoning her cellular connection, we could stream The Return, available via Showtime on Hulu and Amazon, without electricity. This inappropriate usage of data would cost something totally nuts per minute, but “whatever,” said my friend, and I had to agree. To begin with, there was almost no sound. What there was for a score was, with one exception, diegetic, selected vagaries of the soundscape plucked and turned up to make a loose, spare derangement. Fans of the original Twin Peaks (1990–91), not to mention nonfans who also watched it, will remember that Angelo Badalamenti’s influence went way past the theme song, that adult lullaby, to disquiet the breezy scenes, make fun of sad ones, and build a fugue state throughout. Twenty-six years later, the theme remains, but nothing else plays. There are no sideways forays into jazz, no melodramatic crying jags, and few stabs at banter. The hell-bent silence makes the passage of time unbearable, like a subway ride without headphones, or a book, or a friend. Would I say that the first hour is slow? It is so slow that Stanley Kubrick watching it would start thinking about dinner. David Lynch and Mark Frost, cocreators of Twin Peaks then and now, have said that the only scene flagged by the network in the very first episode, which aired on the American Broadcasting Company, was the one where Special Agent Dale Cooper (Kyle MacLachlan), examining the body of a dead Laura Palmer (Sheryl Lee), took tweezers and dug deep under the empurpled nail of her ring finger to retrieve a miniature clue. A close-up on this procedure lasted fourteen seconds, which censors said was too long. It was perfect, yet in a technical sense the censors were correct: It was still TV. The basic differentiating formula for the best TV, or prestige TV, since the two aren’t synonymous, is film minus time. Films, when they’re great, improve on and proliferate life, which is why you don’t leave the cinema anxious about wasted hours, the way you do (I always do) after watching television no matter how good the show, and why it’s possible to watch episode after episode on Netflix or HBO Go without getting around to feeling uncomfortable or stopping to think. Some critics hold that television now is better than film, but though the average show on network television is cleverer, more inventive, more interesting than the average studio movie, suggesting that the best TV rivals the best new cinema, the medium which still represents the apotheosis of time taken and given, is rude and unacceptable unless you live in a town, like Twin Peaks, come to think of it, without a movie theater. All is to say: Lynch knows what he’s doing, and he’s doing the right thing when he calls The Return an eighteen-part film. Not a miniseries––nothing mini about it––and not episodic. To watch more than two episodes in a night would be like eating three cherry pies. Lynch used to hate his show being interrupted by commercials, saying, Imagine if you were at the symphony and every fifteen minutes the music stopped and was interchanged with jingles, and a benefit of streaming is the optional elision of ads. Another cool feature is closed captioning, which on Hulu is customizable, ergo mine is neon lime with a glowed edge to match the titles and credits, and which on The Return gives us incredible, specific descriptors of sound and score. A line dialed by the Log Lady (Catherine E. Coulson) isn’t ringing but “trilling.” Footsteps on tile in the Black Lodge are “odd reverberations.” Skin “crinkles.” In the anonymous woods are “whooshing sustains,” followed by, naturally, an “ominous tone.” But where technology gives godlike it takes away, and new problems show up in place of old ones, like the compression thinning the image-stream on a laptop so that the black ink and shadow flooding the screen turns silty instead of looking as meant: “Dark as pitch, as noir, as hate,” to quote Manohla Dargis in her review of Lynch’s last film, Inland Empire (2006). There is almost no blue. Lynch banned blue-colored props from the set of Twin Peaks in the first season, maybe also the second. This contributed to a long sense of skylessness, redoubled here in The Return. We see only a pressed and dried cornflower blue, subdued further by dank cinematography. The blue stays in the background of Laura Palmer’s iconic school portrait, now displayed in a glass case with assorted trophies. The blue is matched on the bedroom walls of our new, female victim—well, her head is female, severed and floating atop the lumpen, tumescent body of a “male John Doe” (a funny redundancy, its specificity a comment on how the typical anonymous corpse belongs to a hot girl or a woman). There are stomach-dropping aerial shots of New York City and Las Vegas, two added locations that jar the expectation, the memory of Twin Peaks as existing on a map without a territory, but these are exclusive to night. The blue is matched again in the motel room where another woman dies. Twin Peaks: The Return, 2017, still from a TV show on Showtime. Season 3, episode 1. Darya and C (Nicole LaLiberte and Kyle MacLachlan). Photo: Suzanne Tenner/Showtime. There are almost no not-white people. This will become more noticeable and weird as further scenes, with further and extra characters, unfold in those cities, but basically it is as it should be. Lynch specializes in a whiteness that slips from the norm, from seats of power, from centers that are traditionally but never essentially, exclusively white, to become whiteness per se. He doesn’t participate in the creeping normalization that tries to include everyone in a whiteness reconstituted as chill and that to some degree is always white-centric, and he doesn’t show us worlds where anyone, save teenagers bent on going to hell, would seek representation. Rare among major white artists, and almost impossibly, he appropriates whiteness in a manner all at once glib, unstudied, and tender, superficial and earnest, well-intentioned. This appropriative tendency is a huge and underrated part of what we mean when we say “Lynchian.” (In this Lynchianness no one excels more, more obviously, than Lana Del Rey.) Ditto his light grip on irony. Atypically for such a white American, he knows that irony is not sarcasm, is not really funny, and is never on purpose. That Lynch is our guru and genius of white identity is one reason why I see so many fans and critics, and fans who are critics, all of them white, ask or demand that his works be held above and beyond interpretation. Yeah, I think. Nice try. The one near-definitive book on Lynch is by the critic and curator Dennis Lim, who doesn’t subject his taste to questions of either identity or identification, and who nonetheless has taken more care than most of his white peers to understand Lynch. This is an effect of Lim’s talent, and talent is always more or less selcouth, but it’s also no accident: One of the many things white people have refused to see about race is how we’re bound by our own, a refusal that makes us inadequate critics of our best representatives. Those fans and critics who, on the other hand, insist that things be explicable or that they alone have some answers are obviously wrongheaded. Less obvious is the problem: not that some viewers need everything to make sense, rather that they need things to be justified. Some things are simply not forgivable. The solution is not to mystify ignorance. Twin Peaks, 1990–91, clip from a TV show on ABC. Season 2, episode 22. Special Agent Dale Cooper (Kyle MacLachlan). One image appearing briefly in the glass box––a harbinger greeted, as it happens and has to happen, by no one––belongs to the man last seen as Cooper, trapped soul and body in the Black Lodge (long story) for the past twenty-five years. Cooper hasn’t been seen this side of limbo since, possessed by his prime suspect’s demon, he bashed his head into a mirror and asked how Annie was, though he did find time to change into a tux before leaving the dimension. Wandering earth is his doppelgänger, a heartless, successful criminal wearing Lenny Kravitz’s pants, a Samson-haired and literally strong-armed man (what is his arm made of, steel? ), a killer who goes only by “C.” Lynch at his most moral: There are no antiheroes, only heroes who stand to be ruined rather than fall. There are no complications, no excuses, and as he prefers not to diagnose from the director’s chair, there are no pleas of insanity. (A doctor on the original Twin Peaks, opining that Leland Palmer has been driven to kill by madness, triggered by grief, is stopped right there by Special Agent Cooper: “Do you approve of murder, Doctor Hayward?”) This binary starring role for MacLachlan, taken into consideration with his quite prominent billing, over the alphabetical rest of the cast in the end credits, may or may not indicate that the fifty-eight-year-old actor is angling for what we might have to call a “MacLachlanaissance” (cf. Matthew McConaughey’s “McConnaissance,” which peaked with his bravura performance as the philosophical, reluctantly loved, eventually schizo Rusty on season one of HBO’s True Detective). 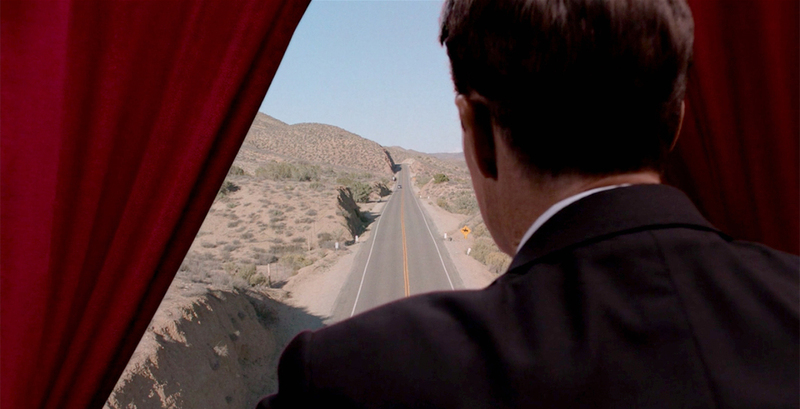 The last we see of Monsieur C, he’s driving what appears to be a 1989 Lincoln Continental (cf. Matthew McConaughey’s Lincoln ads), hearse-black inside and outside, back to where he belongs. The first we see of Twin Peaks in The Return is a lonesome clearing in the woods, and a red truck backing into a gravel driveway as smoothly as if it were shot in forward motion and reversed in post. Doctor Jacoby (Russ Tamblyn) emerges at the door of a derelict trailer home and takes off a pair of shades to reveal another pair, one red lens, one blue, a joke about what—shadiness, layers, the third dimension? A joke about being Lynchian. The driver lifts boxes from the truck, and from the boxes brings objects seen only as shapes, wrapped in plastic. He asks the doc how he’s doing. “Good as ever,” says the doc. Not a joke, a fact about being here. Five minutes before the end of the second hour, my friend’s laptop died, and mine, too, proved dead. The last thing we saw was Shelly Johnson (Mädchen Amick) looking at James Hurley (James Marshall) as the Chromatics, live at the Bang Bang Bar, play a song about darkness. “James is still cool,” Shelly says. “James has always been cool.” I could honestly have cried. Outside the house, the men in orange hats worked overtime under temporary lights. 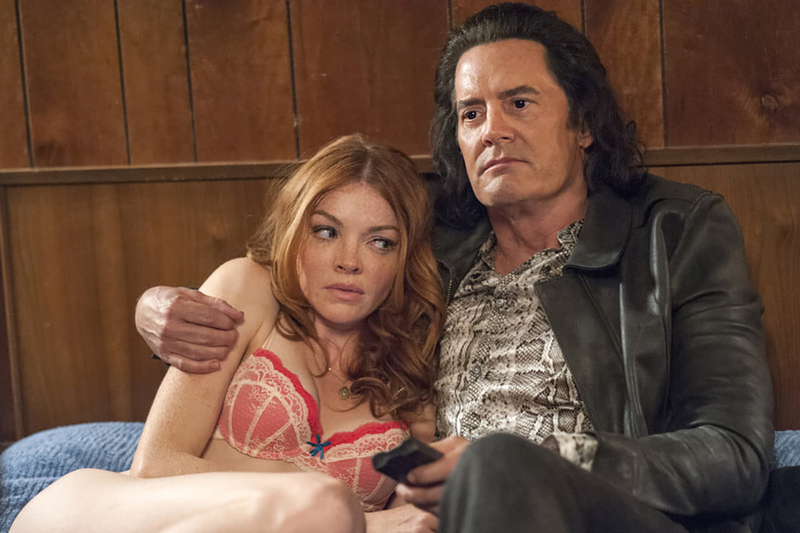 Twin Peaks: The Return premiered on May 21. It runs Sundays at 9 PM on Showtime.